We're looking at the DC Comics November 2016 hardcover and trade paperback solicitations today. The big one, coming for a couple months now, is the first Flash by Mark Waid collection, including Annual crossovers and Flash: Born to Run, leading into next volume's Return of Barry Allen. 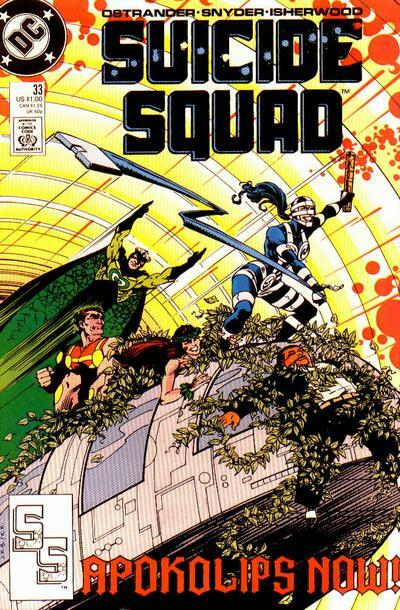 I'm glad too to see new Suicide Squad by Ostrander/Yale and Birds of Prey by Chuck Dixon volumes. We also see the end of Harley Quinn and Deathstroke before each is relaunched for Rebirth. The monthly solicitation listing for this adheres pretty well to what we've heard so far: Waid's Flash Special, issues #62-68, and Flash Annual #4-5. The latter two are Armageddon 2001 and Eclipso: The Darkness Within tie-ins respectively. A note in the solicitation says "montage cover," which I'm curious to see. I noticed these new Chuck Dixon Birds of Prey collections in the comics shop the other day and the fluorescent spines are really cool; they capture the pop 1990s world-traveling aesthetic of this book, in my opinion. This particular collection includes Birds of Prey #12-21 and Nightwing #45-46; if there was any concern that the "Hunt for Oracle" crossover wouldn't entirely be in here, it is. Also within, a trip to Apokolips and Catwoman, Robin Tim Drake, the Joker, and Power Girl. The next collection of Suicide Squad by John Ostrander and Kim Yale, following the "Janus Directive" crossover, sees the team sent to Apokolips. Hard to believe, and wonderful, that we're on volume 5 of this now, when once we were stuck with a canceled "Nightshade Odyssey." Three more collections of the Legends of Tomorrow series. In some respects, new tales of heroes overlooked or left behind by the New 52 is now overshadowed by what Rebirth may bring. On the other hand, I'm plenty curious how, for instance, Metamorpho Rex Mason ties in to Justice League's Element Woman or the business they had with the Metal Men, assuming these miniseries reflect current continuity. If they're "just stories" of these characters, no offense but I'll wait for the versions that'll stick. I still clearly remember staying up all night to read Greg Rucka's Death and the Maidens, his especially harrowing tale of Batman and Ra's al Ghul. If you haven't read it, I can't recommend enough this deluxe edition, which should reprint wonderfully Klaus Janson's artwork. This is supposed to also include unused art and sketches. The end of James Bonny's Deathstroke series before Rebirth, collecting issues #17-20 and the Annual #2, which was written by Phil Hester. Collects Harley Quinn #26-30, the final collection of the series before Rebirth, in which Harley fights some marvelous new character called Redtool. JLA Vol. 9 is a hefty collection and an interesting one for fans of this era. Not only do you have Kurt Busiek's "Crime Syndicate of America" eight-parter (which continues from JLA/Avengers, of all things), but then also Geoff Johns and Allan Heinberg's Identity Crisis tie-in and Bob Harras's Infinite Crisis tie-in. The quality ebbs and flows here but again, it's certainly a significant snapshot of the times. Collects the final issues of Gail Simone's second Secret Six series, issues #7-14. A new edition of the well-regarded Amy Wolfram/Karl Kerschl miniseries. This was one of a couple "Year One" miniseries published in the late 2000s, which I don't believe were ever meant as actual in-continuity origins -- Green Arrow is another one, which did get a continuity reference, and also Black Lightning, Huntress, and Metamorpho. Given this book's more recent-ness and popularity, it'd be interesting if DC made parts of it the Titans actual origin post-Rebirth. A small month for me but I've got to save my pennies for those Rebirth collections anyway. What'll you be buying? Hopefully we'll start seeing Rebirth trades solicited next month. There is also Sandman Mystery Theater vol 2 which (I think) collects issues 13-24. So psyched for the the Waid Flash collection! I'd heard mixed things about Death and the Maidens. I don't think I've read it. Is it really that good, or is it mostly for the Janson art? I so can't wait for JLA vol 9. I've been going through volumes 1-3 recently and have been loving it! It'll feel so good to get to 9 by the time it comes out. That Vol. 9 collection is wild. Lots of material for a crossover/continuity nut. Why didn't you list Batman and Robin Adventures 1? Wasn't on my buying list. Glad it's on yours. Does the Firestorm TPB link to the correct book on Amazon? It looks like it's the wrong one, but I can't find the right one either. I'd also like to know if those Legend of Tomorrow books are in continuity. I'm probably going to buy the Metal Men book anyway, but I'm not sure about the rest. All of the Legends of Tomorrow strips, which were originally commissioned as separate minis, are part of the New 52 continuity. @PeterB - I think the solicitation text is wrong, but the release date is right. @shagmu - Is that explicit? Like the Metamorpho miniseries acknowledges Element Woman running around, or it just doesn't contradict? And would you say the same is true for the Sugar & Spike book (I was under the impression that was too farcical to be in continuity, like the Bizarro mini)? @shagamu thanks for the answer, I guess that makes my to buy list a bit longer. I don't recall Element Woman ever being mentioned in Lopresti's Metamorpho strip. I guess she just had an encounter with the Orb of Ra before he did. Conway's Firestorm is a direct sequel to the New 52 series, though, and Wein picks up the Metal Men from where Johns left them off in Justice League. As for Sugar and Spike, the super-heroes who show up in it are the New 52 versions, even though Giffen tries to put some older stories back in continuity that don't quite fit (especially the one involving Wonder Woman). And the last chapter makes things even murkier by bringing in a bunch of time-displaced LoSH founding members who look more like the pre-Crisis versions than the ones young Clark Kent met in Morrison's Action Comics run. That's how I read the bulk of what I read. Wasn't the Vixen best-of bind-up supposed to be released this month? Is it still upcoming? It was never solicited, and Edelweiss's website says it's cancelled.